Nutone Decorative wired door chime in white color, offers CM1 ding and CM1 ding dong ringing modes. It has a dimension of 5-7/8-Inch x 2-1/8-Inch x 7-1/2-Inch. Chime wires to a 16-Volt transformer for uninterrupted service and never relies on batteries. Molded cover comes with beveled edges and rectangular grooves to complement home decor. 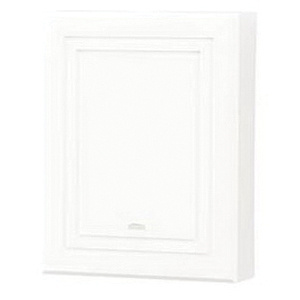 It easily replaces the two-note wired door chime without rewiring for a fast, simple redecorating touch. Chime is suitable for use with two entrances to greet your guests.